Welcoming Hank to the Family! If you can't tell by now, we are a big Golden Retriever family. My husband grew up with Newfoundlands and I grew up with Collies. Somehow, when we decided to get a dog in 2014, we landed on Golden Retrievers and I don't think we'll ever look back. We are both volunteers at the Golden Retriever Club of Greater Los Angeles Area Rescue and I am the graphic designer for Golden Bond Rescue in Portland, OR. We rescued Mac, who passed in December, when he was a ripe 10 years old in 2014. He seriously was the best. If you haven't seen it yet - check out my post below. It forever changed my view on adopting a senior dog and when we have a house that has 1 floor (we currently live on the 2nd floor of a duplex), I plan to always rescue a senior. I don't understand how people can ditch their beloved family pets just because they're aging! 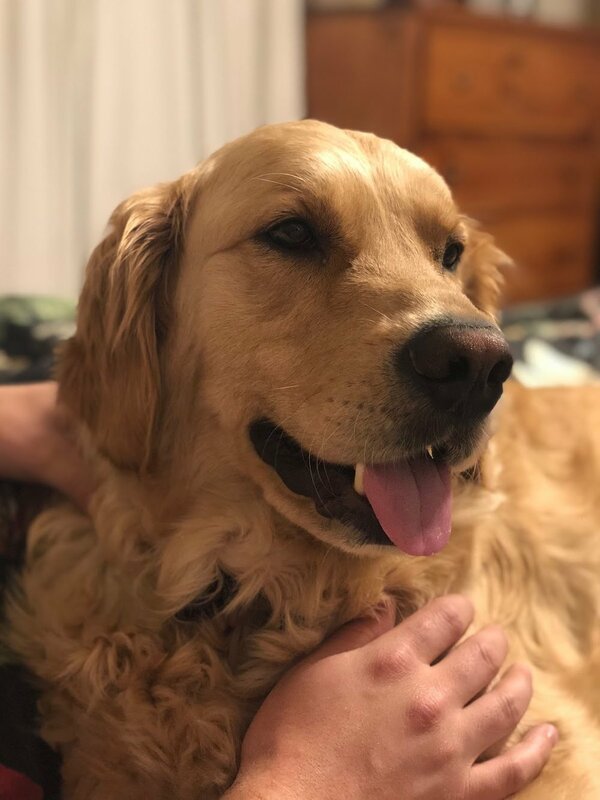 Golden Bond has a special place in my heart because of their dedication to rescuing Goldens from China slaughterhouses. They've rescued nearly 200 Goldens from China and brought them back to the USA for adoption. This cause makes my heart shatter into a million pieces and I am just grateful to be able to help them. If you feel so inclined, you can donate here. Anyway, back to the main gist of this post! A couple weeks after Mac passed, GRCGLAR reached out to us to see if we were ready to foster a sweet 2 year old who was scared and alone in a kennel awaiting foster placement. We definitely were NOT ready but we felt terrible that this pup was so scared and not eating. So, we said yes and our area rep brought him right over. He was renamed by the rescue to...wait for it...Mr. Bojangles! As much character as that name has, we knew he would need a new name. After weeks of deliberation, we settled on Hank. He is 90 pounds of puppy eyes and love. He has no idea how big he is and wants to plop right on your lap. When you walk through the door, he scrambles to find a toy to bring you. He's just the best! It took me a while to connect with him because I was still so brokenhearted over losing Mac, but now that is in the past and he is just part of the family.